Upgrade the style and organize your kitchen and bathroom spaces with new cabinets in Fort Myers, FL. Come into our local store for selection, service, and cabinet installation of your new bathroom or kitchen cabinets. Count on us to carry brand names that promote fashion and function. Talk to one of our sales and design professionals about your vision for your kitchen or bathroom. You can rely on our knowledgeable professionals to go to work to show you the possibilities. It is our goal to provide you with such exceptional service and selection that you find the perfect cabinets for your home and you thoroughly enjoy your shopping experience with us. Greenfield Cabinetry--Make an investment in your home with finely crafted cabinets from Greenfield. This manufacturer builds quality into your cabinets from the choice of materials and hardware to the construction itself. All of this and a limited lifetime warranty, too. 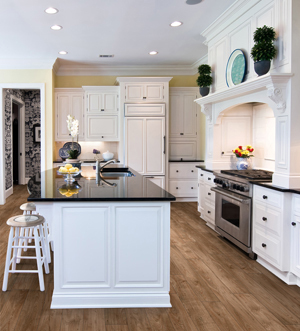 Dura Supreme--This company has been incorporating quality and value into its kitchen and bathroom cabinets for more than 60 years. Dura Supreme has been successful in this endeavor by balancing the beauty of hand-crafting with the efficiency of state-of-the art equipment. This results in gorgeous custom and stock cabinets for your home with a lifetime warranty. Homecrest--Homecrest has perfected the practice of making handsome cabinets for your kitchen or bathroom at cost-effective pricing. Our company believes that great prices, great style, and great quality go together. We build our cabinets so they have what you need to organize your space beautifully. Bertch Vanities: This manufacturer is here to add comfort, convenience, and beauty to your life. We make bathroom vanities, cabinets, vanities, and storage that complement the style of your bathroom while giving you the necessary space for your grooming, cleaning, and paper products, as well as towels. This family-owned business is committed to reforestation and recycling. Once the business of selection is finished, let us schedule professional cabinet installation. We send a team of skilled technicians to your home to install your new cabinets securely. Our local store recommends professional installation so you can enjoy the beauty and benefit from the functionality of your cabinets for many happy years. Contact us now for your free in-home estimate for your new cabinets. We are conveniently located to serve customers in and around Fort Myers, Coral Gables, Punta Gorda, Bonita Springs, and Naples, Florida.